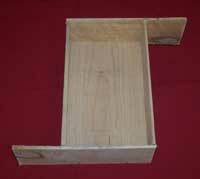 Spread the pie crust in the bottom and up the sides of a parchment lined plank roasting pan (see picture). Spread the diced onions over the crust. Beat eggs, pepper, and heavy cream. Stir in the cheese. Pour mixture over onions in pan. Smoke at 300 for 1 hour or until done.